Smiles start relationships, close business deals and comfort friends. Our artistry and precision can give you the elements of a gorgeous, perfectly natural-looking smile. Let us help you make your smile confident. A bright, new confident smile can be one of your best assets. If you’re unhappy with your missing, damaged, stained or broken teeth, let us explain the options that are available to you. We will help you customize your treatment to meet your goals. With today’s materials, Composite Resin is used predominately. Amalgam or Silver fillings are not used as often as the new resin materials are now durable, strong, and more natural looking. Unlike Amalgam fillings, composite fillings are virtually invisible, giving you a beautiful, silver-less smile... Unfortunately, composite fillings are not permanent and may someday have to be replaced. They are very durable and will last many years, giving you a long lasting, beautiful smile. Compared to fillings which just cover a small portion of a tooth, a crown (or cap) encases the entire visible portion of a tooth. In effect, the crown acts as the tooth’s new outer surface. A dental crown is used when a tooth is broken, cracked or decayed to such an extent that fillings aren’t able to repair the problem. The crown is able to provide a protective shell around the tooth to strengthen it, as well as to improve the appearance of the tooth. While crowns come in different materials, the most common crowns typically have some mixture of porcelain in them to give them a look and feel similar to a natural tooth. They are highly durable, but like most dental restorations, they may eventually need to be replaced. The first visit involves reshaping the tooth and taking impressions to create the crown. Typically a portion of you tooth will have to be removed to make space for the crown to fit properly. After the tooth is reshaped, a special material is used to create an impression of it. This impression will be sent to a dental laboratory to be made into a permanent crown. Before sending you home, a temporary crown will be made to cover your tooth in between visits. When you return, the temporary crown is removed and new crown is fit. Before cementing the permanent crown in place, we will ensure that you are happy with the comfort and appearance of your new crown. A dental bridge is a non-removable appliance used in certain circumstances to replace missing teeth. There are many different bridge types, but the “traditional bridge” is the most popular. Made of porcelain fused to metal, the bridge consists of two crowns that fit over the two anchoring teeth (abutments) adjacent to the tooth to be replaced. An artificial tooth (pontic) is attached between the two crowns to “bridge” the space and fill the gap created by the missing tooth. 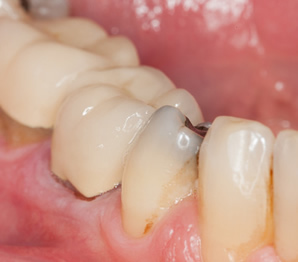 Dental bridges are highly durable, however they may need replacement or need to be re-cemented due to normal wear. 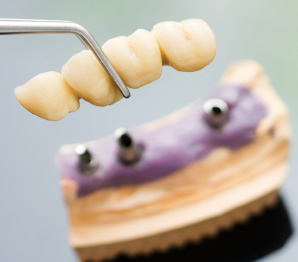 The process involved in making a bridge is very similar to single tooth crowns, but involves more time and planning according to the number of teeth involved. As always, your comfort and expectations are the highest priority when considering this treatment option. Dental bonding is one of the many cosmetic dental procedures our team is prepared to offer. A bonding is a white, plastic-like material, which can be securely attached to your teeth. It is used to repair chipped or broken teeth, fill in gaps and reshape or recolor your smile. If you have close, small gaps between the front teeth, stains, chips, cracks, gum recession, or tooth decay, you may be a good dental bonding candidate. Smokers are poor candidates for bonding since the resin is porous and may yellow from smoking. Everyone wants a bright, confident smile. Our team understands this and is proud to offer our patients the Lifetime Whitening Program. 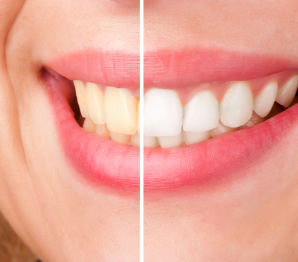 Our Lifetime Whitening Program includes impressions and trays for both arches, 2 tubes of bleach and FREE bleach at each check-up and cleaning appointment as long as you keep your regularly scheduled cleanings. Give us a call to inquire about details or to schedule an appointment. Sparkling, white teeth are the foundation of a memorable smile. Nevertheless, our time, genetics and diet often prevent our teeth from staying as white as we’d like them to. Teeth whitening done in a professional dental setting is a safe, effective way to brighten your smile. It’s also perhaps the most economical cosmetic dental procedure. In-office whitening procedures can produce dramatic results: it can lighten teeth three to eight shades in a single hour. Professionally supervised whitening will work faster, and protect sensitive gums and tooth-root surfaces better, than over-the-counter whitening products. Before deciding to undergo in-office whitening, make sure you have an oral exam to make sure your tooth discoloration is not the result of a dental condition in need of treatment. With proper upkeep, your smile can stay bright and beautiful through in office professional whitening. Your smile is center of your face. A beautiful smile cultivates confidence. Tooth color, shape, alignment and symmetry are some of the many factors influencing what makes a smile beautiful. Discrepancies in any of these factors can be overcome through custom designed dental porcelain veneers. A dental veneer consists of a wafer-thin layer of porcelain laminate that is bonded directly to your existing teeth. A dental porcelain veneer substitutes for defects that time or genetics have afflicted to your teeth. Veneers recreate a natural, beautiful surface that substitutes for natural tooth enamel. When bonded to your teeth, veneers can create a natural-looking, beautiful new surface. With custom fabricated dental porcelain veneers, patients will leave with the beautiful, natural smile that they’ve always wanted.